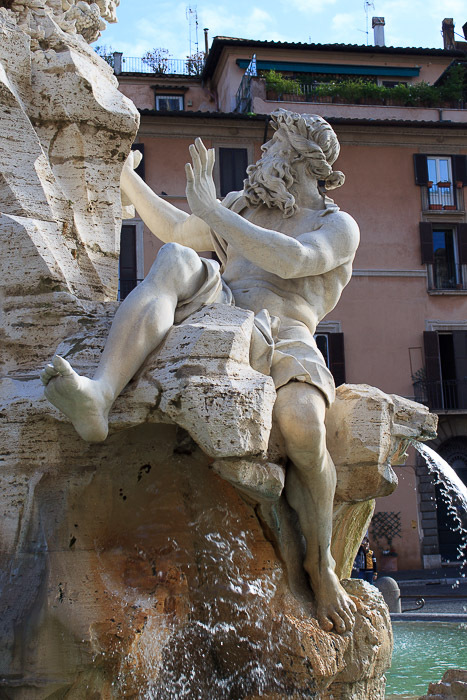 The Fountain of the Four Rivers is located at the center of Piazza Navona, supporting the Agonal Obelisk. 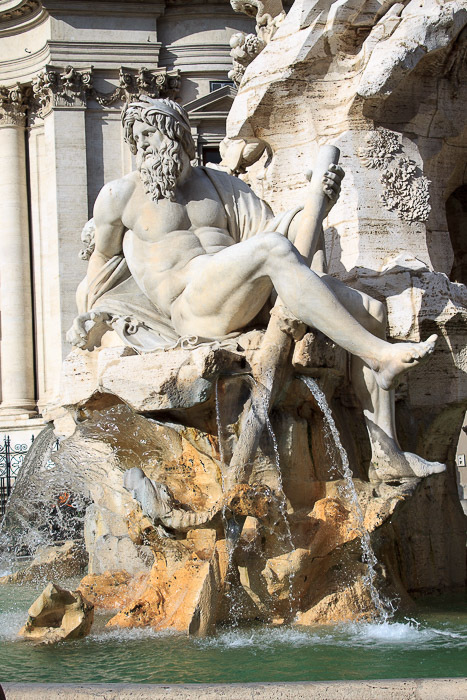 The fountain is a masterpiece of Gian Lorenzo Bernini, a beautiful example of the dramatic effects of baroque artists. Water flows and splashes from varied places in the fountain, slapping on jagged edges of travertine marble, and coming out of piercings in the disordered jumble of stone. Designed for Pope Innocent X, and unveiled on June 12, 1651, the fountain consists of a basin at ground level from which travertine rocks rise to support four burly river gods above them, representing the four great rivers of the four continents of the world that were known in 1650, and above them, the ancient Agonal Obelisk which was recovered from the Circus of Maxentius and topped with the Pamphilj emblem of a dove with an olive twig. The base of the obelisk is cut through in both directions, creating the illusion that the obelisk is unsupported. The fountain is right in front of the church of St. Agnes in Agone which was built after the fountain, in 1652, and not far from the Pamphilj Palace just south of the church. See all Fountain of the Four Rivers photos. The Danube, representing Europe (1st photo below), by Antonio Raggi, is looking at the obelisk. It touches the Papal coat of arms with its right hand since it is the large river closest to Rome. Beside him, a horse is protruding from the rock he is seated upon. (2nd photo above). The Nile, representing Africa, (2nd photo below), by Giacomo Antonio Fancelli, has his head covered with a loose piece of cloth since no one at that time knew quite where the Nile's source was located. Beside him a lion, emerging from the hollow grotto is bowing his head for a drink of water, while a palm tree is being blown by the wind. The Ganges, representing Asia, (3rd photo below), by Caludio Poussin, holds an oar which represents the river's navigability. A large sea serpent is wrapped around his oar. The Rio del la Plata in Uruguay, representing the Americas, (4th photo below), by Francesco Baratta, is falling backwards. It is sitting on a pile of coins, a symbol of the riches that America could offer to Europe. An armadillo stands behind him, but it's obvious that the sculptor really didn't know what an armadillo looks like. 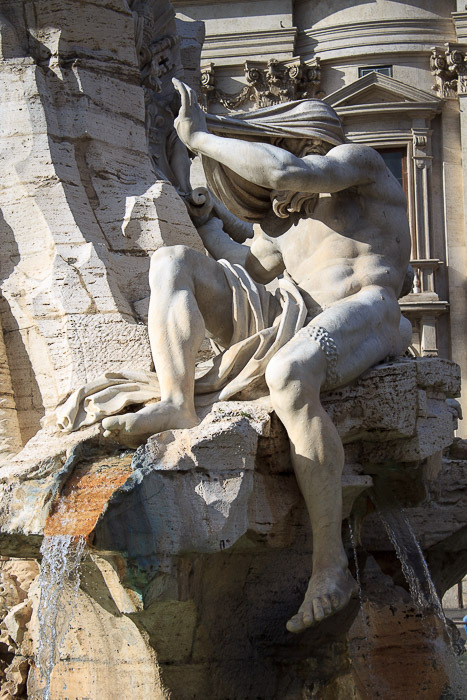 According to some, his arm is upraised to protect itself from the imminent collapse of the church of St. Agnes in Agone that had been enlarged by Bernini's great rival Borromini, but this interpretation is suspect since the fountain was completed several years before Borromini began his work on the church. Actually, the upraised hand is shading the god's face from the blinding light of the obelisk, which represents rays of sunlight. In the basin under the fountain, a fish with its mouth wide open serves as one of the drains. Other fish swim in that basin. The obelisk is magically mounted above empty space, as shown in the 2nd photo above. 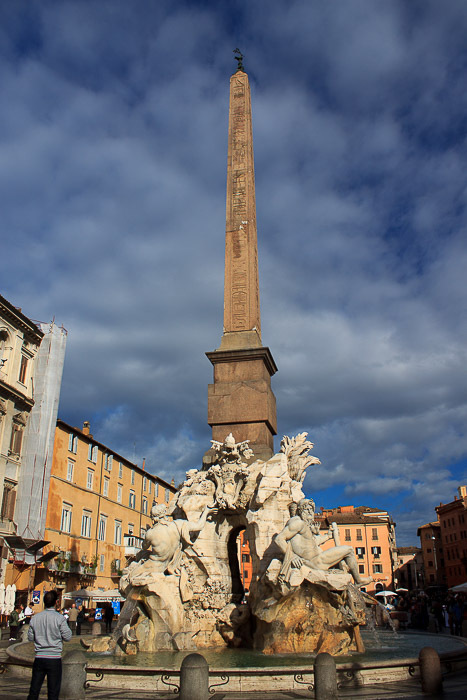 When the fountain was unveiled, Bernini's critics claimed the obelisk would surely fall over due to lack of support. 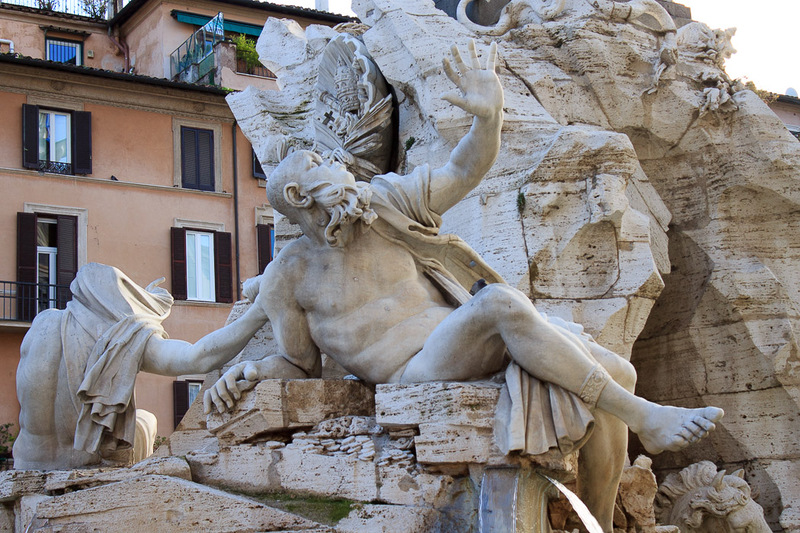 Bernini answered this criticism by tying strings from the top of the obelisk to nearby buildings. 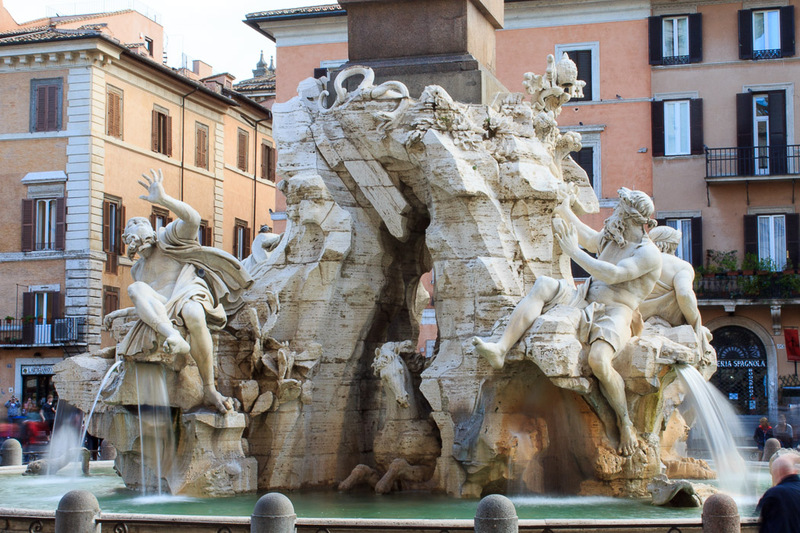 When compared with fountains which preceeded this one, such as the Big Fountain (1610), the Moses Fountain (1585), and the Fountain in Piazza Campitelli (1589), this fountain was revolutionary in its inventive depiction of characters and the interplay of water with those characters and their surroundings. A hundred years later, this same style of presentation would be used in the queen of all foutains in Rome, the Trevi Fountain (1762).